I am a Geek, Early Adopter, Ham Radio guy, Broadcaster,Podcast Producer, DJ, Graphics Guy, Web guy, Ex-USAF, Aviation Nut, Husband, Gun Nut, Banjo Picker(attempted), Tuba Player and all around good guy. I live in God’s country, Otherwise known as Traverse City Michigan USA with my wife Kathy. We have a cat and a Beagle and love living along the shores of East Grand Traverse Bay on Northern Lake Michigan in our 1940’s log cabin. I am also an Online Technology Coach. I have the ability to explain the most geeky things in plain English (and other languages if I use Google translate 🙂 ). If you are looking for someone to help with something you would like to do online and don’t want the geek-speak, give me a call or check out my resources page. I would be happy to give you a quote and some instruction. 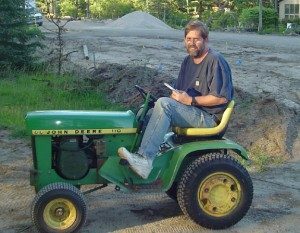 Mike Dell’s World is my blog and podcast from and about Northern Michigan and whatever else comes to mind. This is my Hobby Podcast. I’ve worked in Graphic Arts for over 21 years first at Village Press and then freelance. and for a small print shop in Traverse City. For the last 7 years I have worked as Tech Support and Sales for RawVoice Inc. (Parent company to Blubrry.com and TechPodcasts.com) Part-time. As of 2016, I am the Customer Support Coordinator for Blubrry Podcastng full time.